Currently the world offers a variety of different marketing platforms to businesses. Since there is a bifurcation of the audience across all marketing platforms, it is very important for businesses to understand and evaluate cross-channel consumer behavior. Majority of our time is usually spent in front of a technological device, like: – TV, computer, Smartphones, tablets, mobile phones and other portable devices. Each of these platforms has its own reach and their own respected benefits. Amongst this list, Smartphones are increasing in popularity the fastest. Smartphones attracts all age groups ranging from: teens, housewives, working professionals, everyone is attracted towards the instant search facility of this medium. So when you optimize your website for smartphones, you really cannot ignore the primary channels as well. Hence, drafting an effective content and mobile strategy is a must. There are two ways to have a website that is cross compatible with tablets and smartphones, two options are by building a responsive website or building a custom mobile website. This class of consumers is always in the quest to buy the product right away i.e. without any delay. Something like same day delivery or even delivery within the next few hours. Companies need to ensure that the information about the latest products, services and deals is updated on their website or mobile platform. It is because these consumers want to buy the specific product/service; they would ideally type the exact keyword. So it is important to optimize the website accordingly. This category of consumers prefers to do price comparisons before buying a product/service. For example: – you can track the IP address of the Wi-Fi to find out the search count per day, month or year. Consumer behavior can be assessed and understood by analyzing their purchase and/or search history. For example: – as an online store owner, you can find out the number of abandoned shopping carts you have, preferences of a particular customers, etc. So the next time when they visit your site, you can suggest them new products/services based on their past searches. 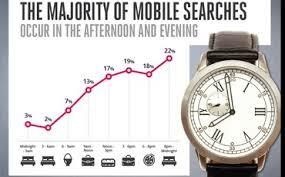 The purpose is for companies to figure out their search behavior of the consumer’s base. Once that is figured out it is important to have an effective search engine marketing plan to reach on top of all searches engine rankings and to optimize your website for different devices and handsets. To find out more, please Contact Us SEO Consultants.